Bringing together a diverse range of professional tone tools for the very first time, the Waza Tube Amp Expander elevates the tube amp experience to a new level of versatility for stage performing and studio recording. 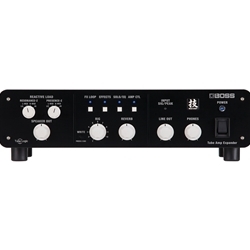 This amazing device does it all--it’s a variable reactive load box, active analog power stage, mic’d cab emulator, IR loader, and recording interface, all in one integrated unit that’s road-ready and easy to use. Backed by the advanced Tube Logic approach, you’re able to crank your amp to its sweet spot and play at any volume while faithfully retaining the core tone and feel you love. And with extensive connectivity, built-in BOSS effects, 10 fully customizable rig setups, and deep real-time control, you have unparalleled creative command for any scenario. Packed to the max with breakthrough BOSS innovations, the Waza Tube Amp Expander is an essential companion for every tube amp player.